When was the last time you filed a flight plan using ForeFlight? For some of you the answer may be “10 minutes ago”, and for others it may be “You can file in ForeFlight?” Regardless of how many times you’ve tapped the File & Brief tab, or how you currently file, filing in ForeFlight has many great features that will get you to the runway faster and with maximum preparation for the flight ahead. 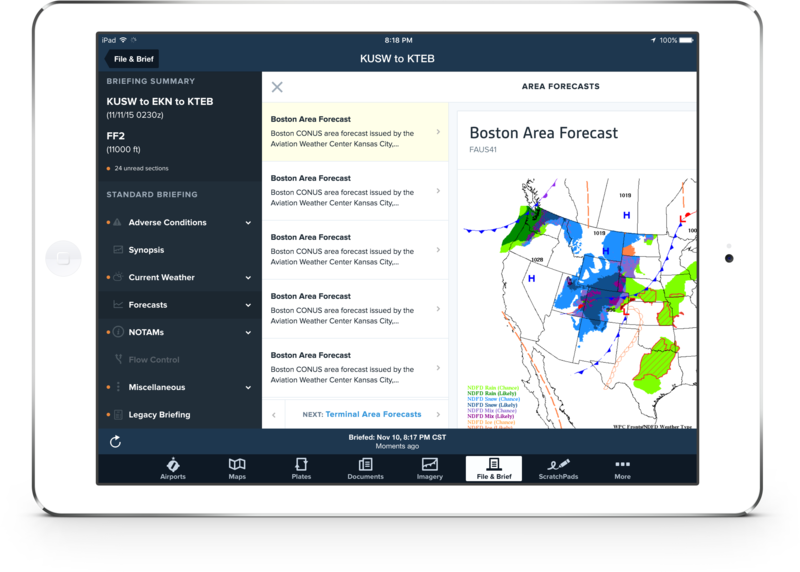 Here are six of the most compelling reasons to start using ForeFlight as your all-in-one flight plan filing solution today. ForeFlight’s File & Brief view makes completing a flight plan form as simple as a few taps: copy your route details from the Maps view using the Send To button, then set the departure time and tap File. Integrating with the flight planning engine saves you the time and effort (and possible mistakes) of re-entering flight details in the form, especially IFR flight plans with lots of airways and waypoints. Smart flight plan form entry shines when you file with the ICAO flight plan form, soon to be required for all VFR and IFR flights in the US. You don’t have to keep track of the difficult formatting rules, as ForeFlight automatically handles this for you. You’ll never have to call flight service again to amend, cancel, or activate a flight plan, as you can accomplish all of these things right from the File & Brief view. To change a filed flight plan, tap Amend, edit your flight information, then tap File Changes. Flight plans can also be cancelled or activated with a tap of a button. 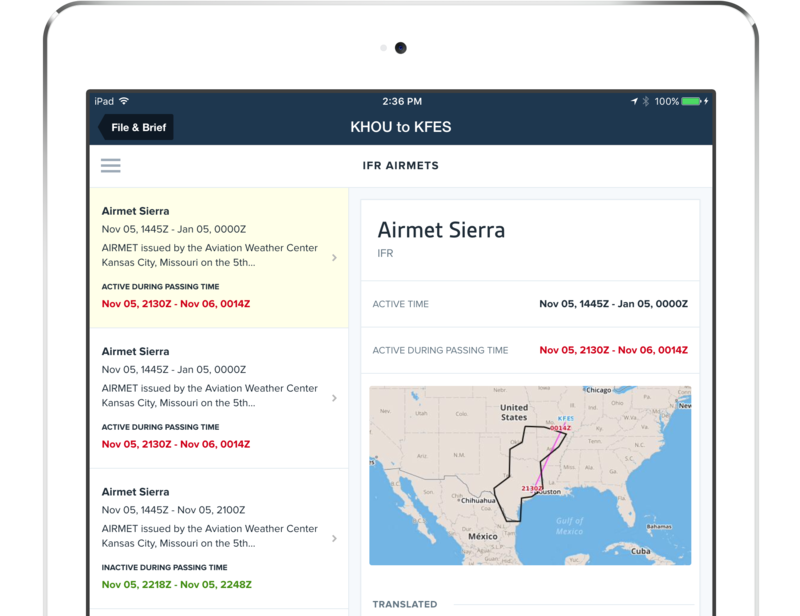 ForeFlight gives you the tools to take control of your flight plan without delays. Once you’ve filed your flight plan, weather conditions and NOTAMs can change, sometimes significantly enough to affect your go/no-go decision. ForeFlight will notify you when changes occur with the Flight Notifications feature, available with Pro and Pro Plus subscriptions. 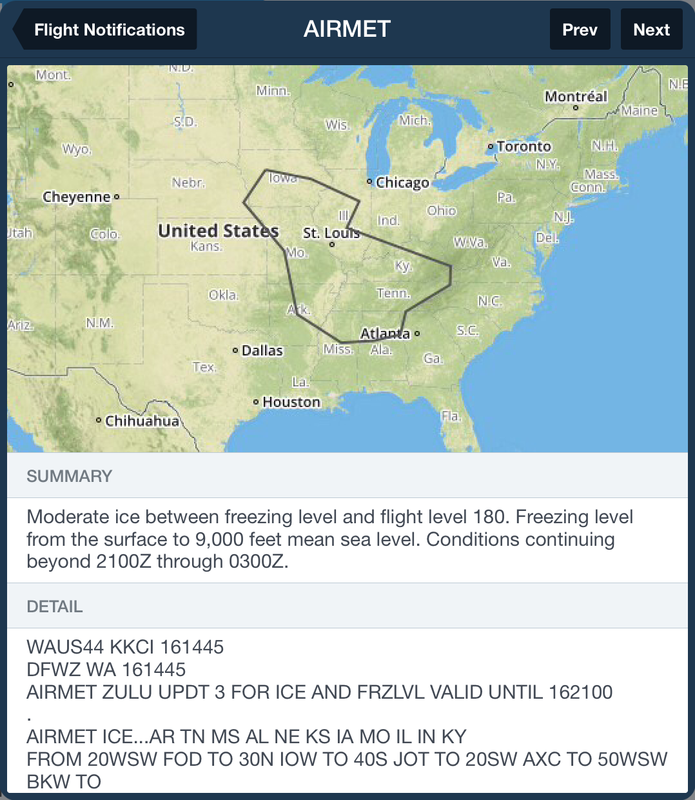 Flight Notifications provide text and graphical depictions of AIR/SIGMETs, TFRs, NOTAMs, urgent PIREPs, and more. ForeFlight begins monitoring your filed route for changes two hours prior to your scheduled departure time, and notifies you of the changes with a red badge on the File & Brief tab and a prominent banner at the top of the view. With IFR flight plans, ForeFlight will also notify you when ATC issues an expected route or acknowledgment for your flight plan. These are sent by the ForeFlight servers directly to your device, even when the ForeFlight app is closed. ForeFlight’s Graphical Briefing delivers the next generation of preflight briefing, with translated information presented in a visually elegant design to enhance readability. It has all the elements of a standard preflight briefing, including AIR/SIGMETs, TFRs, NOTAMs, forecasts, current conditions, and more, without the tedium of page-after-page of coded text. 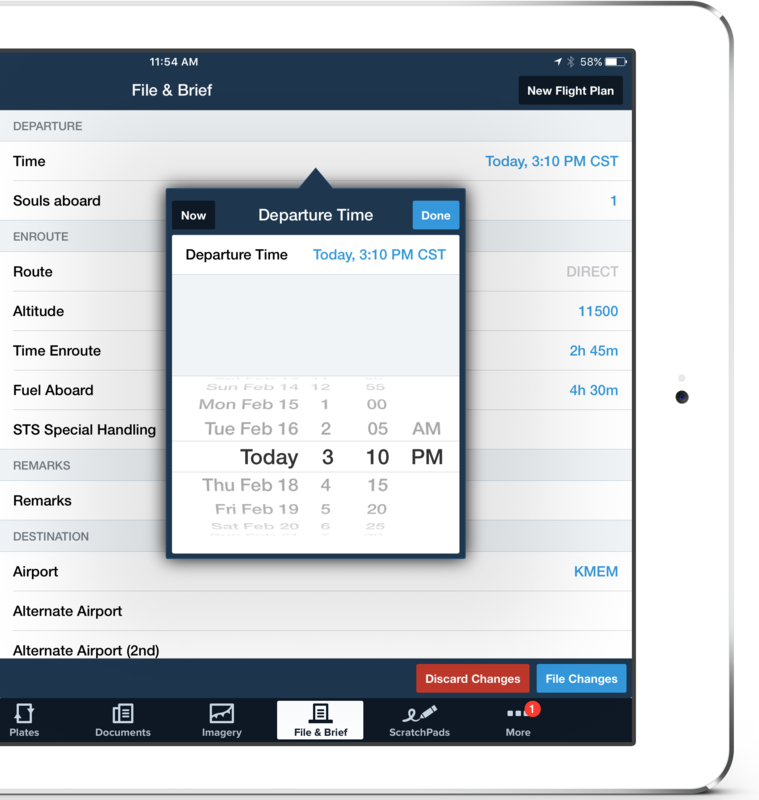 The briefing serves as the perfect complement to the simplicity and ease that characterizes the rest of ForeFlight’s filing process. Every flight plan you file and briefing you retrieve are saved securely both on your device and in the ForeFlight Cloud. This is important for more than just record-keeping — if you ever have to prove that you obtained weather and pertinent NOTAMs in compliant manner with 14 CFR 91.103(a) preflight action, your briefing will be available and timestamped to provide this proof. While all the features listed above are great on their own, perhaps the best reason to file with ForeFlight is that they’re all available in one place, building on each other to provide the smoothest filing experience. Consolidating your flight planning, filing, and flying resources into a single location guarantees maximum efficiency, a sentiment we have heard from many of our customers in Part 135 operations, where efficiency is required to stay in the game. You can get the details of filing in ForeFlight in the Pilot’s Guide to ForeFlight Mobile, or in the Filing with ForeFlight Mobile guide, which focuses on ICAO flight plan filing.